Who doesn’t love a big hunk of lasagna with melty cheese oozing from its soft pasta layers? Little chunks of sausage and meatballs hidden among the ricotta and mozzerella waiting to be discovered and dug out like tiny treasures in a red sauce filled landscape flavored by oregano and garlic? Sadly, devouring all that lasagna goodness requires unbuttoning one’s pants and taking a long winter nap followed by a guilt filled morning and a long, joyless trip to the gym. Is it really worth it? My longing for all that is craveworthy about lasagna and my desire not to feel guilty or gluttonous about consuming such a rich meal has led me to search out viable alternatives. I will be honest. I was skeptical at first about this soup recipe that I was finally able to find on the food network website. How could one recreate the flavors, decadent feeling and tastes in a soup that is far less caloric than its inspiration? I decided it was worth a try. As you have probably already suspected, this soup recipe delivers on all counts: melty cheese from the fresh ricotta dollops, creamy and tomatoey sauce, chunky noodles and bits of Italian spiced meat. If you are feeling extra hungry, make some garlic bread to dip in your bowl. This soup makes a comforting and somewhat guilt free meal. I changed up some parts of the recipe but included the link to the original if you want to check it out. http://www.foodnetwork.com/recipes/food-network-kitchen/lasagna-soup-2268968. The recipe for the Ricotta cheese is a combination of a few from my research mixed up with my memory of a recipe that I once had from a friend of mine. Unfortunately, I cannot find my original copy but I think I came pretty close in recreating it. Make the Ricotta a day or a few hours in advance. Heat olive oil in a large Dutch oven over medium high heat. Add the onion and cook, stirring until onions soften, about 4 minutes. Add the sausage, garlic and oregano. Cook, stirring and breaking up the sausage with a spoon until the sausage is browned and cooked through. Add the tomato paste and cook, stirring until darkened, about 2 minutes. Add the chicken broth, tomatoes, Parmesan rind ( wait to add the cheese, if using grated) and 1 cup water, cover and bring to a simmer. Uncover and cook until slightly reduced , about 10 minutes. Meanwhile, boil water in a large pot and add the lasagna noodles. Cook according to package directions. Drain and add to soup. Add milk, parmesan (if using grated) and basil. Simmer for about 1 minute. Divide the soup among bowls and top with small dollops of Ricotta cheese. Line a large strainer with 4 layers of cheese cloth being sure that it hangs over the sides about an inch or two. Place the strainer over a large bowl. In a large, heavy pot slowly bring milk, cream and salt to a rolling boil. Stir it occasionally to prevent scorching. Add the lemon juice, then reduce the heat to low and simmer, stirring continuously, until the mixture curdles. This takes about 2 minutes. Using a slotted spoon, scoop out the curds and place them in the strainer lined with cheese cloth. Let the cheese drain for at least and hour. Use the cheese immediately or place it in a covered container in the refrigerator. It will keep for about 2 days. *You can use the liquid from the cheese, called whey in all types of ways. It’s protein rich. Use it in smoothies and bread recipes instead of milk or water. **This cheese tastes delicious when served with salty crackers and topped with honey. Last week, a high fever ran rampant through our house. It threatened to derail all holiday tasks and planning. Thankfully, I had already made this soup. The tender chunks of zucchini, zesty tomato base and filling chicken sausage made it the perfect antidote to my sickeness. My eleven year old preferred gingerale and nutella on crackers to combat his cold. That’s o.k. I was so sick, I didn’t even get mad at him for refusing to even try it. I ‘m glad to have had plenty of this soup to heat up and eat in my bathrobe while I wished my cold away. All I could think about was how much I still had left to do: the holiday baking, shopping, wrapping and don’t forget all the driving. It seems my kids are doing just about everything possible at this point in their lives. It’s good that they are busy and happy to participate in all manner of activities from tap dancing to travel basketball. But all I wanted to do was lay on the couch and watch Iron Chef. Needless to say, that didn’t happen. I am on the mend now and able to document the recipe that brought me back to the living. The original source is from and incredible cookbook called, Soup Swap by Kathy Gunst. I changed up a few things. Mainly the sausage: I used chicken and could not find hot Italian chicken sausage at my local market. Instead, I used some Italian chicken and cheese sausage and chicken and kale sausage. It worked. I also added a parmesan rind to the soup as it simmered to add some richness to the broth. Fresh basil at this time of year is pretty rough, if you can find it at all in a New England supermarket, so I opted to leave it out. Here is my version of “Hope’s Italian Sausage-Zucchini Soup”. I hope you make it in good health. Heat oil in a large soup pot over medium high. remove the casings from sausage and add to warm oil. Cook sausage, breaking up pieces as it browns. Once the sausage is cooked through, add the onion and garlic. Turn heat to medium low and cook until onion is softened, about 5 minutes. Season to taste with salt and pepper, if necessary. Add the tomatoes, parsley and sugar. Cover and simmer for 20 minutes. Add the zucchini, celery, yellow/orange pepper, chicken stock, chili flakes and parmesan rind. Raise the heat to bring to a boil, then lower the heat and simmer for 15-20 minutes until the vegetables are tender. Taste and adjust the seasonings, adding more salt and pepper if needed. To serve: ladle into bowls and top with grated parmesan and chopped parsley. Aaah, holiday treats! Candy canes, chocolate Santas and all manner of inventions to be found on Pinterest! But truly, nothing says Christmas time more to me than the flavor and scent of gingerbread cookies. Especially these gingerbread men cookies: my mother Val’s recipe found in her Woman’s Day Encyclopedia of Cookery. She accumulated each volume by collecting stamps at the supermarket. Those books served her cooking repertoire well, long before the internet came along. I can understand now that I have two kids of my own going here and there, them needing rides and chaperoning in every waking moment of the day that Val had to delegate the cookie making to us kids considering she had three children’s activities schedules to juggle. 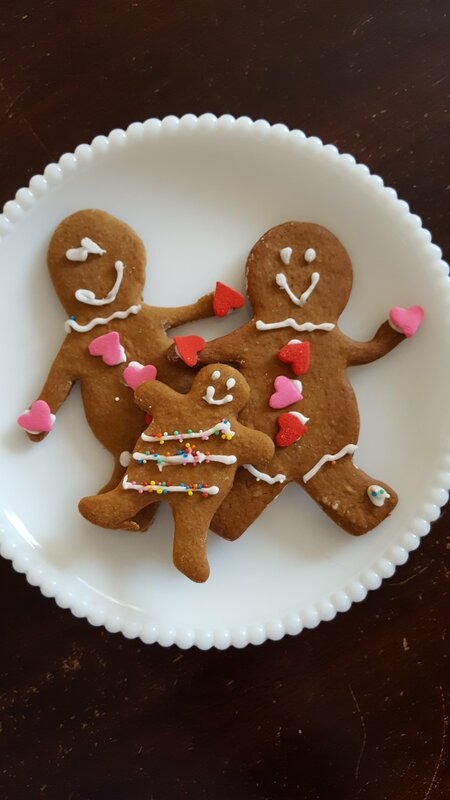 Sometimes the cookies came out well but many of them were often burnt on the edges or undercooked and the decorating….let’s just say that after the one time my younger brother was allowed to help, his presence was no longer requested in the kitchen. Gingerbread men covered in red gel frosting for blood and green gel camo outfits were not what my mother had in mind to hand out to her friends as holiday gifts. We ate a lot of gingerbread men at home that year. Whatever your decorating style, I am sure that you will find these cookies to be tasty. They hit all the right notes in flavor and aroma from the molasses and ginger. Perhaps you will be brave enough to employ some child labor of your own in the decorating. Or you can drop the kids off to their scheduled activities and keep the fun of adding frosting and sprinkles to yourself. Remove about 1/2 cup of dough from the refrigerator (keep the rest chilled while you are working). Roll out dough on a well floured board to 1/8″-1/4″ thick. Cut with floured cutters and place cookies on ungreased cookie sheets. ( I use Silpat liners or parchment paper would work well, too.) Bake for 10 to 15 minutes until just before cookies brown on edges. Remove from oven and allow to cook for 5 minutes. Transfer cookies to wire racks and cool completely before decorating. If planning to hang cookies on tree, make a hole about double the size you want the end result to be in the cookie BEFORE baking.